A new Zogby Interactive poll, conducted using volunteers over the internet, has produced some odd results for trial heats involving Senator Clinton against all four top Republican opponents. What makes this especially odd is that the results are not equally unusual for Obama. This poll was reported by Reuters' John Whitesides, who also reports on the Reuters sponsored polling Zogby does by conventional telephone methods. The similarities in the reports make it hard to tell, but apparently these results are not part of the Reuters-Zogby polling partnership, but are independent work by Zogby Interactive. Likewise Zogby's website posts the results without mention of who sponsored the work, so presumably Reuters did not. The Zogby poll was conducted 11/21-26/07 with 9150 respondents who had agreed to take part in Zogby's online polling. This is not a normal random sample of the population. More on the technical issues below. The hugely surprising result is that the Zogby poll finds Sen. Hillary Clinton losing to all four top Republicans in head-to-head trial heats. What makes that surprising is that Clinton LEADS all four of those Republicans in the trend estimates based on all other polling by between 3.8 and 11.6 points. Zogby also has Clinton losing to Arkansas Governor Mike Huckabee by 5 points. 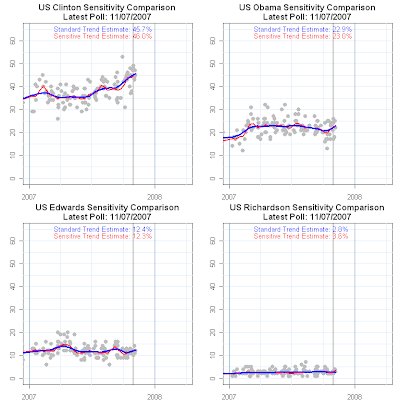 There are too few Clinton-Huckabee trial heat polls from other organizations for me to compute a trend estimate for that comparison. The chart above shows all the trial heat data from national polling and the estimated trend lines for each pairing. The data points for the new Zogby data are indicated in the charts as "Zogby Inet" in blue for Clinton and red for each Republican. 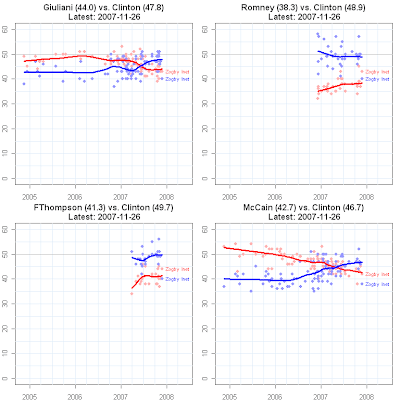 What is immediately clear is that the Zogby Clinton numbers are well below the estimated trend for Clinton in each of the four comparisons. 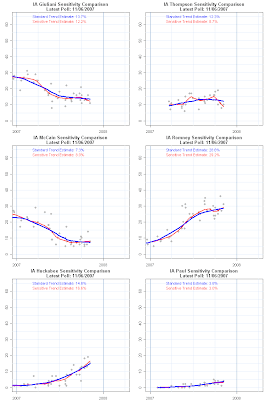 Clinton is consistently 8-10 points below her trend estimate based on other polling. In contrast, the Republican results are quite close to the trend estimate in most cases: Giuliani is at 43 in Zogby, with a trend of 44. 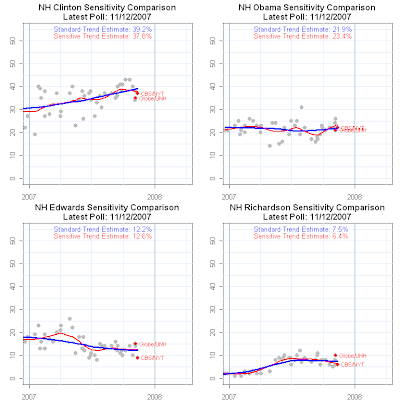 Romney is 43 in Zogby, 38.3 in trend; Thompson is 44 in Zogby, 41.3 trend, and McCain is 42 Zogby, 42.7 trend. Those Republican numbers are about the kind of normal noise we see around the trend estimate, so don't seem out of line. Some Democrats have expressed concerns about the former first lady's electability in a race against Republicans. The survey showed Clinton not performing as well as Obama and Edwards among independents and younger voters, pollster John Zogby said. While this is certainly a theme of recent reporting, boosted by a pre-Thanksgiving ABC/WP poll showing Obama leading Clinton in Iowa, it is striking that no other poll has found recent results as far from the trend estimates as are Zogby's results and that the Reuters story fails to note that fact. One answer to why Clinton does so badly MIGHT be that the poll has too few Democrats and thus biases its results. 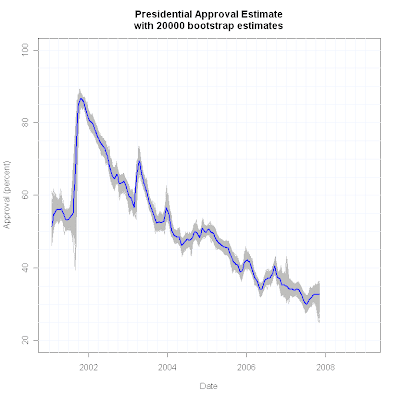 But if that were so, we'd expect Obama to also underperform his trend estimates. That doesn't happen, as the chart below makes clear. 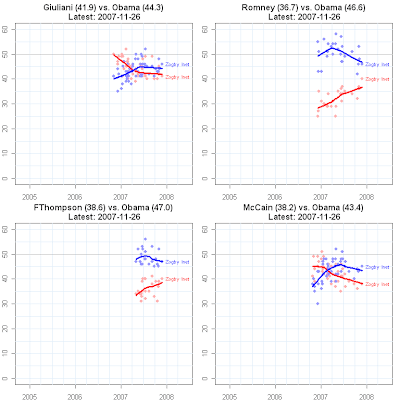 Zogby has Obama at 46% vs Giuliani, while the trend puts him at 44.3. Against Romney Zogby has Obama at 46%, while trend says 46.6. Against Thompson Zogby has Obama at 47, while trend is 47.0, and against McCain Zogby has Obama at 45 while trend puts him at 43.4. This is clearly not consistent with a general anti-Democratic bias in the Zogby Internet poll. 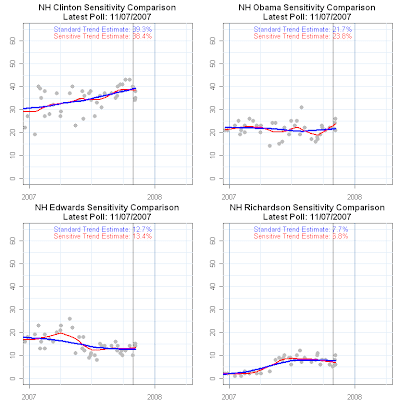 It is also clear from the graph that the Obama pairings find Republicans doing quite close to the trend estimates as they did against Clinton. And so we are left with a puzzle: What is it about these respondents that so strongly affects Clinton support but no one else? The Zogby Internet polling has a questionable track record in statewide races for Senate and Governor in 2006, where they often far over-estimated the competitiveness of races compared to conventional phone polls taken at the same time. One way to make sense of those problems turns out not to help much here. It is reasonable that the people who volunteer to take political polls over the internet are considerably more interested in politics (and likely more strongly partisan) than is a random sample of likely voters. That should be expected to lead to fewer people with "don't know" responses as better informed and more partisan respondents are likely to both know more about the candidates and to have made up their minds sooner than a proper random sample. 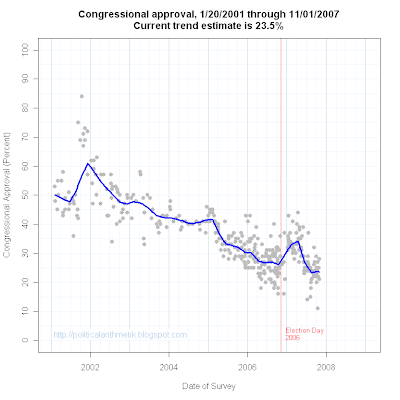 That helps explain why Zogby's 2006 internet polls looked as they did. But this does no good in Clinton's case. What we see is that MORE internet respondents are undecided about their vote between Clinton and four Republicans than the trend estimates based on less involved and partisan phone samples show. The Zogby undecided rates for the Clinton pairings are 20, 17, 17 and 16% (plus 17% undecided in the Huckabee comparison.) 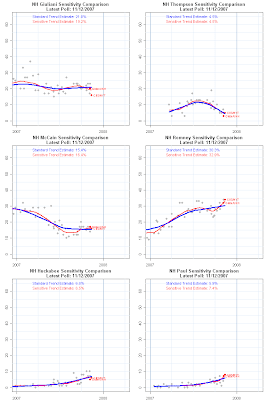 The comparable undecided rates based on the trend estimates are 8.2, 12.8, 9.0 and 10.6. That is an average undecided rate of 17.5 in Zogby vs 10.15 in the trends. Likewise the undecided rate is slightly lower for Obama pairings than it is for Clinton: 17, 13, 14, 13, and 14 for Huckabee. How could it be that a sample that is almost certainly more involved, knowledgeable and partisan can be LESS decided about Cinton, the single best known figure in the race? Again, a tortured story might be constructed, but I think a simpler explanation is that this result is not consistent within the Zogby data itself, or in comparison with outside polling. Where does this leave us? Puzzled. If these results came from voting machines, I'd suspect that something in the ballot design or the recording mechanism caused a modest but consistent undercount of the Clinton support. The effect seems confined only to that one candidate, and not to any others, Democrats or Republicans. And there was no boost in support for the Republicans paired against Clinton. In this case, I'm similarly inclined to wonder if there is the possibility that the Zogby online survey had a glitch that caused a systematic "undervote" for Clinton. Certainly if my research assistant brought me these results, I'd want to check the software for mistakes before I published it. Let's assume the Zogby organization has checked for any such possible mistakes or glitches and has ruled that out. (One would assume they were as surprised by the data as anyone and since their reputation is on the line, would have checked very carefully before releasing the data.) 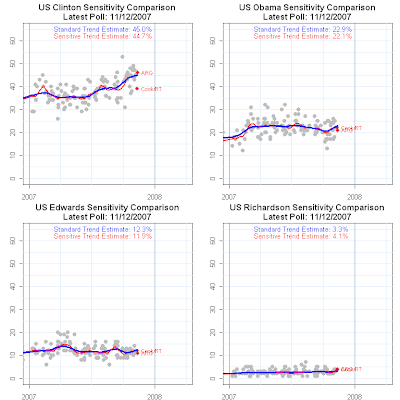 Is there any reasonable model of how candidate preferences are evolving that might explain this result, and the stability of Republicans paired against Clinton AND the stability of Obama support and that of his Republican pairings? Without access to the raw data it is impossible to test any speculation here. But here is one possibility: Internet polls, presumably including Zogby's, use weighting to adjust for non-representativeness in their volunteer respondents. (There is a huge debate about whether this, and more sophisticated approaches, can produce generalizable population estimates with good statistical properties, but we'll leave that for another day.) Clinton has more support among women and somewhat older people. Both those groups are likely to be underrepresented in any pool of internet respondents. As a result the responses of those with these characteristics who ARE present in the sample are likely to be weighted up quite a bit to reach population proportions in the weighted sample. If the relatively few older women who are in the sample are ALSO atypical in other ways that both make them volunteer for internet surveys AND be less disposed to support Clinton than are non-internet volunteering older women, then weighting these respondents up won't properly capture Clinton's support and will lead to a systematic underestimate of her support. That could do it, but it sounds pretty tortured to me. I'd check the software one more time. And based on the large outliers the Clinton results produce, I'd hold off on the Reuters headline until I saw some confirmation from other polls. I don't have time to write about these, so let's let six pictures do the talking. The blue line is the standard trend estimate, and the red the more sensitive trend. I've added the names of the last two polls (last three if there is a tie on the date of last interview.) This helps put the latest results in some perspective, both poll vs poll and poll vs trend. 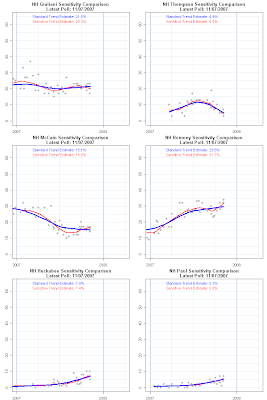 These are relatively high resolution plots so you may need to click once or twice for full resolution. The Republican race has had something for everyone this year. Front runners have faltered (McCain, remember, was the widely declared "front runner" until early spring, though he trailed Giuliani in the vast majority of national polls.) The puzzle of Giuliani's national lead continues to confound explanation in a party of social conservatives. Despite the most visible pre-primary season in history, the leader in IA and NH, Romney, remains less known nationally. The reluctant actor waited in the wings and perhaps missed his scene, certainly entering after his peak. And just to round things out there is an Arkansas governor from Hope who is beginning to be taken seriously and a Texas congressman whose internet strength is disproportionate to his polls. The single most important feature for the Republican race is the discrepancy between state polls in IA and NH and the national polls. Nationally, Giuliani continues to hold a significant lead of nearly 2:1 over his nearest rivals. But in the initial states, Romney has established his own 2:1 lead in IA and a smaller 8 point lead in NH, while Giuliani struggles in IA and has remained basically flat in NH. This sets up Romney to run a classic momentum campaign based on two early successes to carry him to national prominence and through the second round of pre-February 5th primaries and caucuses. 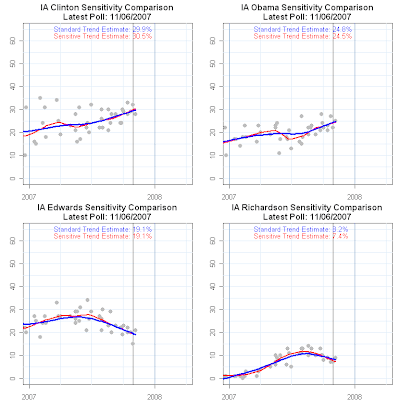 The Iowa data in the top chart shows Romney's early success there, reaching 20% by April 1, when his national support was a modest 8%. Romney has now built his support to nearly 29% in Iowa, a significant lead over his rivals there, though not enough to dominate the race. Meanwhile he is at less than half that (12%) nationally. Romney demonstrated his organizational strength by winning the Iowa straw poll back in August. But that story also demonstrated a potential problem for him. The straw poll win would have been news to many Republican primary voters outside of Iowa, where Romney still needs to build his visibility and support. But the press corps (and pollsters) strongly discounted his win as "expected", and focused instead on the narrow second place finish of Mike Huckabee, well behind first place. This seems to be the danger for Romney in January. He has carefully built a strong Iowa presence and support and if the election were held today would probably win (you do believe these polls, right?). That would be big news to lots of voters, and should dominate the headlines. 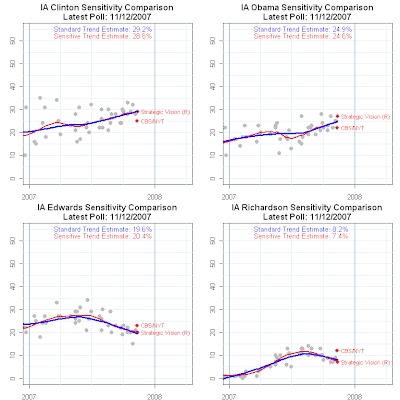 But Romney's lead in IA has become conventional wisdom among reporters and a win is likely to be treated as the straw poll win-- news, but not surprising. The surprising second place finisher would be Huckabee, based on current polls, and that would likely be the bigger story from Iowa. 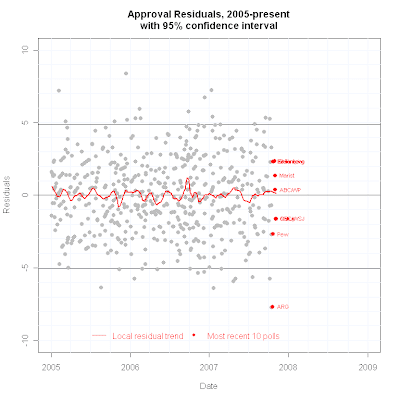 The rise of Mike Huckabee in Iowa is correctly seen as a big polling story. With limited money Huckabee has climbed into second place in the Iowa polls, and currently enjoys the sharpest upward trajectory of any Republican candidate there. While still well behind Romney, a Huckabee defeat of both Giuliani and Thompson would be legitimate "big news", and could propel the former Arkansas governor to the kind of national momentum he must have to compete after Iowa. His current trajectory is getting him noticed more, and his second place standing probably deserves even more attention than it is currently getting. Coupled with Thompson's failures, Huckabee's ascent could be come a major asset. The other bit of news from Iowa is the failure of the Thompson campaign to launch. For all the high expectations built up in the pre-campaign campaign of Thompson, Iowa voters have failed to respond. The trend has even taken a bit of a turn down in recent weeks. At only about 12% support, Thompson trails Huckabee and Giuliani. And the picture only gets worse for Thompson in New Hampshire where his trajectory looks like a failed rocket launch, now at less than 5% support. It is debatable whether Giuliani, as national leader in the polls (see below) can survive losses in Iowa and New Hampshire. It seems even more unlikely that Thompson, who is falling nationally as well, can survive two poor early finishes. This morning's news is that Thompson will receive the endorsement of the National Right to Life Committee, a potentially important boost to his campaign. The organizational strength of Right to Life organizations could be a significant advantage, and might help Thompson secure the status of "choice of social conservatives". However a consensus candidate of social conservatives has yet to emerge, as demonstrated by the scattered endorsements we saw last week. If Thompson is to secure that standing it will come despite his standing in the polls, rather than because of it. Certainly the fear of other Republicans that Thompson would be the late arrival who swept all before him as not materialized. And then there is John McCain, who has been all but written off by analysts, including me. Yesterday's news that McCain may actually borrow money to finance his campaign through the early caucuses is further evidence that the analysis is not wrong, at least in an organizational sense. McCain's campaign not only lost most of its staff, it has failed to raise money and is back to the days of the bus. Voters, however, haven't entirely gotten that message. McCain's long decline in the polls halted in the third quarter and has made a small gain nationally. A similar rebound may also have occurred in New Hampshire (but only in the more sensitive red estimator.) Still, at 15% there, McCain would be a distant third place, hardly a strong foundation to relaunch a campaign despite previous success in NH. And in Iowa, never his strong suit, McCain is at a dismal 7%, despite his line that he "drinks a cup of ethanol before breakfast every day". The contrast between Giuliani as national poll leader, while Romney dominates in the first two states, and a possible late emergence of a relative unknown in Huckabee, sets the stage for a candidate to "emerge" from Iowa and New Hampshire. The Giuliani campaign still banks on a "firewall" in Florida and a great February 5th to maintain his campaign, and some chance that a convincing 2nd place in New Hampshire will keep him strongly in the game. For Thompson, South Carolina looks to be his best bet, though he is currently only tied with Giuliani for first place there, and is declining there as well. (A SC win for Giuliani would be huge, of course.) And Romney has had two good a two mediocre polls in SC recently, leaving it unclear if he is moving up there or not. McCain still needs a miracle. But Huckabee has moved in Iowa strongly and a little bit in New Hampshire. Elsewhere he will live or die based on those two states. As a spectator sport, the Republican race this year has something for everyone, and is vastly entertaining. I can't wait to see what happens next. New polls: Marist/WNBC (10/29-11/1/07) Approve 34%, disapprove 58%; Gallup (11/2-4/07) approve 31%, disapprove 64%; NBC/WSJ (11/1-5/07)approve 31%, disapprove 63%. With these new polls, the trend estimate moves to 32.6%. 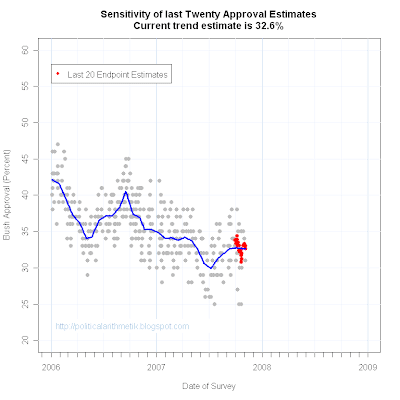 The rise in approval since June has now clearly leveled off and is perhaps starting slightly down. Both the conservative blue trend estimate and the more sensitive red line agree on both the level of the trend and its recent changes. After a flurry out both high and low outliers in recent weeks, the current crop of polls are generally falling within the 95% confidence interval around the trend. 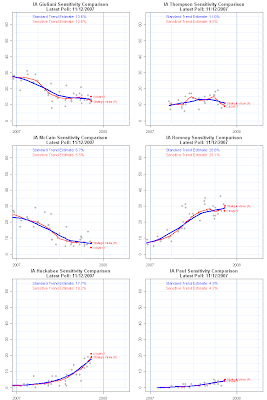 The last 6 polls are all quite close to the trend estimate. I wrote yesterday about changes in opinion of the Iraq war. In the process I said that the death toll is rarely presented in systematic form by news coverage. Totals, or totals for the month are frequently mentioned, but seldom in the context of the entire war. Likewise, yesterday's news story was that 2007 has now become the costliest year, with more U.S. deaths than in any previous year of the war. So let's take a little of our own medicine and put the monthly totals in context. The last two months have indeed seen substantially fewer US losses than any previous months in 2007. April, May and June produced exceptionally high casualty counts with only 5 previous months reaching the same level of over 100 deaths. In contrast, October casualties fell to under 40 deaths, a low matched in only 7 previous months. But looking at the last 12 months, it is really only September and October that have been well below recent casualty rates. There is some visual impression of a sharp decline since May, but that is deceptive since May was the third highest death toll of the entire war. The bottom line: deaths have declined recently and especially in the last two months. But that decline is from very high levels compared to the rates in the entire war. Even the "lower" September rate is actually in the middle of rates for the war as a whole. 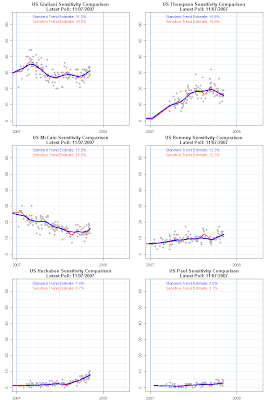 There is a lot of month-to-month variation in the death rate. 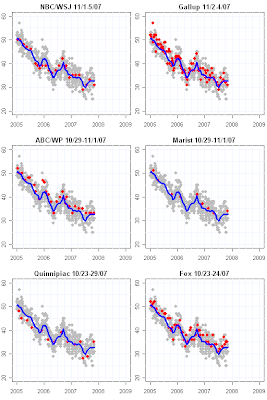 That makes it a bit hard to see the systematic trend in the midst of the variability. The plot below shows the trend in deaths, abstracting out the noise of month to month variation. Yesterday my point was that opinion on the war has turned somewhat more positive, but that while changes in the "objective" facts of the war might contribute some to that shift, the stronger driver of opinion was political debate from Washington. Looked at over the entire course of the war, there have been large month-to-month changes in the casualty rate. Opinion on the war shows no evidence of such high variability, as it should if opinion of the war simply and directly mirrored contemporaneous casualty rates. Rather we've seen a pretty consistent long run decline in positive views of the war, but in 2007 a flattening of the trend followed by a recent rise in positive views of the war. Those changes came despite the substantial rise in casualties in 2007. There is little evidence of a direct link of opinion to current casualty rates. While I've been doing back room work the last two months, some interesting changes have taken place in opinion about the war, the president, congress and the country. It is too early, and the changes too modest, to declare this a "turning point" in opinion, but the changes are consistent enough to take a hard look and ponder if there is still potential for significant shifts over the next 52 weeks until Election Day 2008. The single most striking shift is the change in opinion about how the war in Iraq is going. After four and a half years of steady downward trends, there has been a reversal of direction since July. CBS, CNN and Pew have asked "How well is the military effort in Iraq going?" since the war started (with some minor variation in wording. See the details here.) The virtue of this question is its consistent use over time and its summary evaluation of the war. President Bush's change of policy in Iraq in January, coupling a change of command with a surge of troop levels did not produce immediately positive responses from the public. Likewise the rise in U.S. casualties in the spring following the change in deployment strategy certainly might have been expected to further erode support for the war and for Bush. But in retrospect the actions have been accompanied by two phases of changing opinion on "how the war is going". From January through June, the long running collapse in positive evaluation of the war (especially in the second half of 2006) halted. The flattening now appears to have clearly coincided with the change in command and troop levels. This flattening didn't signal rising opinion on the war-- but after dropping over 13 percentage points in six months, simply arresting the collapse was a major plus for the administration. And this is a particularly striking thing given that the spring of 2007 was a focal point for critiques of the war in Congress, with Democratic leadership repeatedly pushing votes that would have required changes in Iraq policy of various kinds. And this flattening came at the same time that casualties rose. The second phase of opinion change started in early July, when positive evaluations of the war took their first upturn since late 2003 (around the time of the capture of Saddam Husein). The trend estimate has turned up some 8 percentage points since July 1, still not back to early 2006 levels, but remarkable this late in an unpopular war and with a weak leader and determined opposition. It is also worth noting that this is not just a shift due to "undecided" citizens shifting. 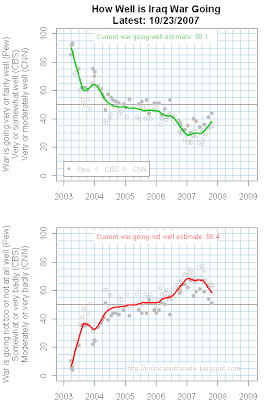 The percentage saying the war is going badly also stabilized through the spring and has turned down to about 58%, from a high of 69% at the end of 2006. But citizens don't shift their opinion based on quantified measures of progress, nor even New York Times or Weekly Standard articles. For most citizens, opinions are driven more by the messages they hear from partisan leaders, with some sifting for credibility of the claims and filtering by predispositions. And, it must be added, by some effects of "reality", whatever that is. The current upturn in positive views of the war then reflect perhaps some bits of success on the ground. US deaths are down. 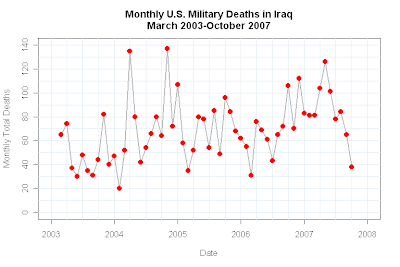 Iraqi civilian deaths are down. 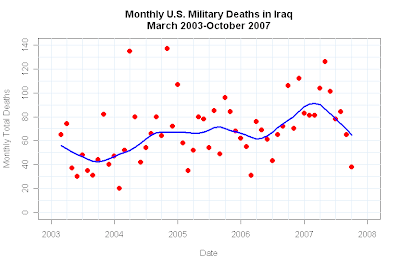 But if it were casualties alone that drove opinion, positive views should have fallen sharply in the spring as the death tolls of both US troops and Iraqis increased. Instead opinion became flat. So it would be too simple minded to imagine a direct causal effect of casualties on views of the war. So what to make of the upturn in positive views of how the war is going? Republicans (including the president) have made real progress in swaying opinion to their side, while 10 months of Democratic efforts have failed to persuade citizens that the war continues to be a disaster. The war of partisan persuasion has tilted towards the Republicans and away from the Democrats, at least in this particular aspect. Let's be clear: the trend estimate is that only 38% think the war is going well, while 58% say it is not going well. The balance remains on the pessimistic side and by a 20 point margin. What I am talking about is the change in trend and the shift of marginal opinion. But that is a telling indicator. On election day a year ago today, the partisan war for public opinion seemed to have decisively shifted to the Democratic view. The notion that there was nothing the White House could do to reverse their public losses of support was widespread. But the last 10 months show that indeed there was something that could change and this change is important. Much could still change before election day 2008, twelve months from today. Either positively or negatively for the war, and even more so for the candidates currently seeking to inherit the war from President Bush. But the past 10 months of opinion on how the war is going should serve as a reminder that the politics of war, like politics in general, is always open to change. 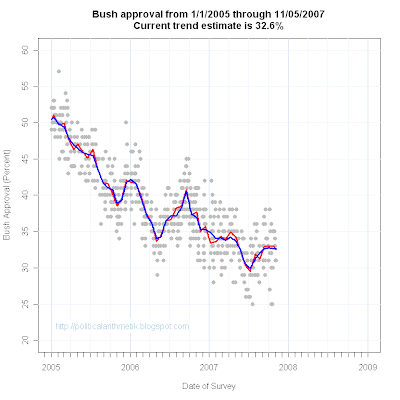 Overall evaluation of Bush has turned up since July. 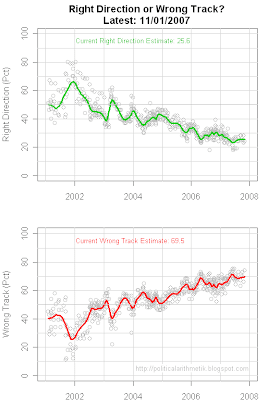 Right track or wrong direction has flattened recently. There are some changes taking place in trends that have been taken for granted. It is time to reexamine our easy and comfortable assumptions. This post is part of a series monitoring opinion on the war in Iraq. It is updated in place as new data are added. The index in the right column provides a direct link from the thumbnail to this page. CBS: "How would you say things are going for the U.S. in its efforts to bring stability and order to Iraq? Would you say things are going very well, somewhat well, somewhat badly, or very badly?" CNN: "In general, how would you say things are going for the U.S. in Iraq: very well, moderately well, moderately badly or very badly?" Pew: "How well is the U.S. military effort in Iraq going? Very well, fairly well, not too well or not at all well?"